Ludwig's seven-ply birch and Italian poplar shells produce outstanding projection and tonal definition. Strong chrome-plated lugs and triple-flanged hoops are standard. Each single headed concert tom is fitted with a durable protective trim on the bottom bearing edge. Ludwig's classic double-tom stands are completely angle-adjustable, featuring tom mounts and large serrated rubber feet. 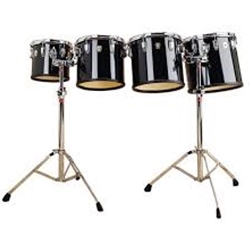 This High-Range Concert Tom Set includes 6", 8", 10" & 12" Toms, and 2 tom stands. Free shipping with your purchase today. Free shipping with your purchase today.